For SIHH 2014 Cartier this week previews two timepieces that reinterpret classic complicated wristwatch functions. One, the Rotonde de Cartier Astrocalendaire, remakes the perpetual calendar while the other, the Rotonde de Cartier Earth and Moon, makes its tourbillon the backdrop for a fascinating moonphase-on-demand function. For the perpetual calendar, the 45 mm Rotonde de Cartier Astrocalendaire presents the user with an amphitheater. 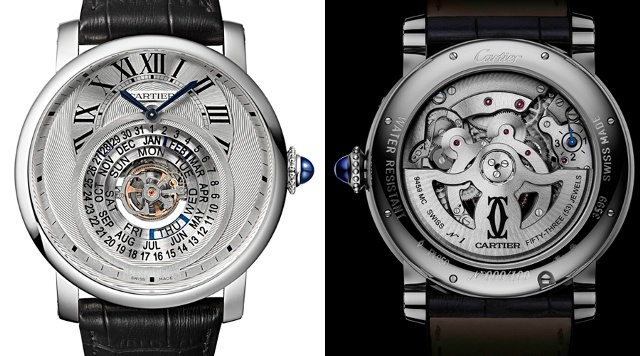 In the center lies a tourbillon topped with a Cartier C-shaped bridge and surrounding it are the various indicators spread out in three levels: the day is indicated on the first, followed by the month on the second and on the third is the date. Thin blue-edged windows move along these tiers to indicate each calendar function. The perpetual calendar’s final function is indicated by a hand located on the back of watch and shows whether the current year is a leap year or a normal year. All the calendar functions are set via the crown except for the day, which is advanced by a pusher. Made in a 100-piece limited edition in platinum, the watch features calibre 9459 MC and has been certified "Poinçon de Genève (Geneva Seal). The 47 mm Rotonde de Cartier Earth and Moon offers a playful moonphase indication that appears only when the wearer desires to see it. By pressing the pusher at four o’clock on the side of the case, a panel descends and partially obscures the Tourbillon carriage at the 6 o’clock position. The crescent thus formed reproduces exactly the moon’s shape in the sky at that moment. 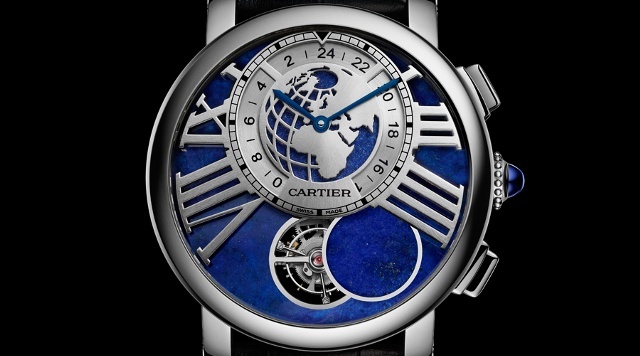 In addition to the moonphase indicator, Cartier created a second time zone display just above the tourbillon in the shape of a 24-hour disc around a gold and lapis lazuli earth. 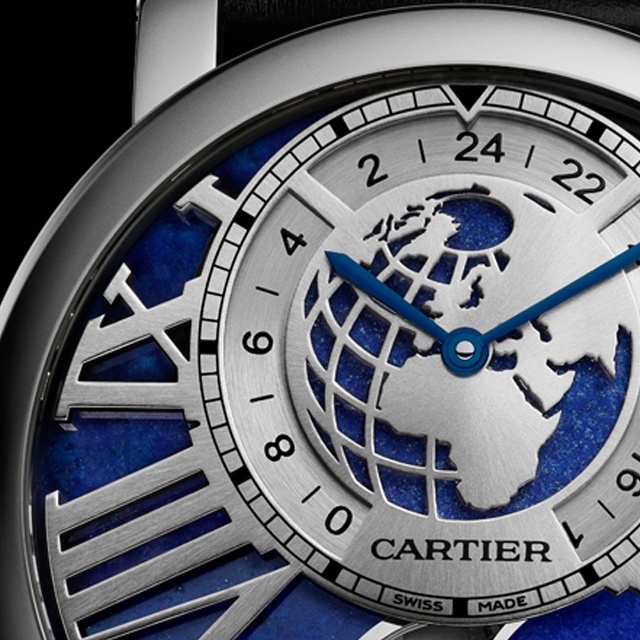 Cartier also uses lapis lazuli on the dial and on the moon indication. The three- dimensional dial is open-worked and chamfered by hand, recalling similar work done on Cartier’s skeleton models. The back features a semi-skeletonized star-shaped bridge. This model, also in platinum, will be made in a limited edition of fifty pieces. Next week we will show you additional Cartier 2014 models, including a new first-ever in house dive model and a smart-looking Tank MC Two-tone Skeleton watch.